From - Choose your starting season to view statistics for, going back to 2007-08. Thru - Choose your end season to view statistics for, up to 3 seasons for everyone, 4 season for Patreon "Subscriber" tier supporters, and 5 seasons for Patreon "Early Access" tier supporters. Season type - Pre-season (starting in 2010-11), Regular Season or Playoffs. All Situations - All play during regulation and overtime, not including the shootout. Even Strength - Play where both teams have the same number of players (including goalies) on the ice. Includes 5v5, 4v4, 3v3, as well as when teams have pulled the goalie to turn 5v5 into 6v5, 4v4 into 5v4 or 3v3 into 4v3. 5v5 - Play where both teams have five skaters and a goalie on the ice. 5v5 Score & Venue Adjusted - Play where both teams have five skaters and a goalie on the ice, with the event counts adjusted for home ice advantage and leading or trailing score effects. This is done using the method created by Micah Blake McCurdy. Power Play - Play where the player's team has more players on the ice than their opponent due to penalties. Includes 5v4, 5v3, 4v3, as well as when teams have pulled the goalie to turn 5v4 into 6v4 or 5v5, 5v3 into 6v3 or 5v4, and 4v3 into 5v3 or 4v4. 5 on 4 PP - Play where the player's team has five skaters and a goalie on the ice versus four skaters and a goalie their opponent due to penalties. Penalty Kill - Play where the player's team has fewer players on the ice than their opponent due to penalties. Includes 4v5, 3v4, 3v5, as well as when teams have pulled the goalie to turn 4v5 into 5v5 or 4v6, 3v4 into 4v4 or 3v5, and 3v5 into 4v5 or 3v6. 4 on 5 PK - Play where the player's team has four skaters and a goalie on the ice versus five skaters and a goalie their opponent due to penalties..
All Scores - All scores, start to finish. Tied - Any time the game is tied. Within 1 - Play when the game is tied, or within a goal of being tied. Leading - Play when the player's team is in the lead by any number of goals. Up 1 - Play when the player's team is in the lead by exactly one goal. Trailing - Play when the player's team is behind by any number of goals. Down 1 - Play when the player's team is behind by exactly one goal. Counts - For and against statistics are presented as total counts. Rates - TOI is presented as TOI/GP. For and against statistics are presented as the counts per 60 minutes of play. Relative - TOI is presented as TOI/GP. For and against statistics are presented as the counts per 60 minutes of play relative to the team's numbers with the player dressed but not on the ice. Teams - Shows only players for the chosen team, and only results from time spent playing for the chosen team. Position Position is based on what each player has been listed at by the NHL for each individual game. Skaters - Everybody but the goalies. Forwards - Any player that has been listed at a forward position. Center - Any player that has been listed at Center. Left Wing - Any player that has been listed at Left Wing. Right Wing - Any player that has been listed at Right Wing. Defenceman - Any player that has been listed at Defence. Goalies - Any player that has been listed at Goalie. Home & Away - Includes both home and away games. Home - Only show results from games where the player is playing for the home team. Away - Only show results from games where the player is playing for the visiting team. Min TOI - Set a minimum amount of ice time for a player to have their results displayed. None - Includes all games. By Date - Includes only games played between (and including) the "From" and "Through" dates. By Team Games - Includes only the last number of games of your choice that the player's team has played. Combine - For players that have played for more than one team, shows one line of combined results for all teams they have played for. Split - For players that have played for more than one team, shows a separate line of results for each team they have played for. All player statistics are presented within the scope of the selected filters. Team - Team or teams that the player has played for. Not displayed when filtering for specific teams. Position - Position or positions that the player has been listed as playing by the NHL. TOI - Total amount of time played. TOI/GP - Amount of time played per game. Not displayed when filtering for Counts. Corsi - Any shot attempt (goals, shots on net, misses and blocks) outside of the shootout. Referred to as SAT by the NHL. CF - Count of Corsi for that player's team while that player is on the ice. CA - Count of Corsi against that player's team while that player is on the ice. Fenwick - any unblocked shot attempt (goals, shots on net and misses) outside of the shootout. Referred to as USAT by the NHL. FF - Count of Fenwick for that player's team while that player is on the ice. FA - Count of Fenwick against that player's team while that player is on the ice. Shots - any shot attempt on net (goals and shots on net) outside of the shootout. SF - Count of Shots for that player's team while that player is on the ice. SA - Count of Shots against that player's team while that player is on the ice. Goals - any goal, outside of the shootout. GF - Count of Goals for that player's team while that player is on the ice. GA - Count of Goals against that player's team while that player is on the ice. Scoring Chances - a scoring chance, as originally defined by War-on-Ice. Each shot attempt (Corsi) taken in the offensive zone is assigned a value based on the area of the zone in which it was recorded. Attempts made from the attacking team's neutral or defensive zones are excluded. 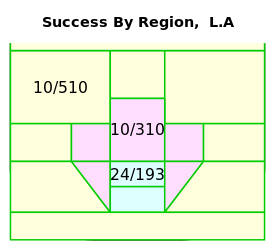 Attempts from the yellow areas are assigned a value of 1, attempts from the red areas are assigned a value of 2, and attempts in the green area are assigned a value of 3. Add 1 to this value if the attempt is considered a rush shot or a rebound. A rebound is any attempt made within 3 seconds of another blocked, missed or saved attempt without a stoppage in play in between. A rush shot is any attempt within 4 seconds of any event in the neutral or defensive zone without a stoppage in play in between (originally defined by David Johnson on the now-offline Hockey Analysis, and modified to 4 seconds by War-on-Ice). Decrease this value by 1 if it was a blocked shot. Any attempt with a score of 2 or higher is considered a scoring chance. SCF - Count of Scoring Chances for that player's team while that player is on the ice. SCA - Count of Scoring Chances against that player's team while that player is on the ice. High Danger Scoring Chances - a scoring chance with a score of 3 or higher. HDCF - Count of High Danger Scoring Chances for that player's team while that player is on the ice. HDCA - Count of High Danger Scoring Chances against that player's team while that player is on the ice. HDGF - Count of Goals off of High Danger Scoring Chances for that player's team while that player is on the ice. HDGA - Count of Goals off of High Danger Scoring Chances against that player's team while that player is on the ice. Medium Danger Scoring Chances - a scoring chance with a score of exactly 2. MDCF - Count of Medium Danger Scoring Chances for that player's team while that player is on the ice. MDCA - Count of Medium Danger Scoring Chances against that player's team while that player is on the ice. MDGF - Count of Goals off of Medium Danger Scoring Chances for that player's team while that player is on the ice. MDGA - Count of Goals off of Medium Danger Scoring Chances against that player's team while that player is on the ice. Low Danger Scoring Chances - a scoring chance with a score of 1 or less. Does not include any attempts from the attacking team's neutral or defensive zone. LDCF - Count of Low Danger Scoring Chances for that player's team while that player is on the ice. LDCA - Count of Low Danger Scoring Chances against that player's team while that player is on the ice. LDGF - Count of Goals off of Low Danger Scoring Chances for that player's team while that player is on the ice. LDGA - Count of Goals off of Low Danger Scoring Chances against that player's team while that player is on the ice. Off. Zone Starts - Number of shifts for the player that started with an offensive zone faceoff. Neu. Zone Starts - Number of shifts for the player that started with an neutral zone faceoff. Def. Zone Starts - Number of shifts for the player that started with an defensive zone faceoff. On The Fly Starts - Number of shifts for the player that started during play (without a faceoff). Off. Zone Faceoffs - Number of faceoffs in the offensive zone for which the player was on the ice. Neu. Zone Faceoffs - Number of faceoffs in the neutral zone for which the player was on the ice. Def. Zone Faceoffs - Number of faceoffs in the defensive zone for which the player was on the ice. Goals - Goals scored by the player, outside of the shootout. Assists - Any assist by the player. First Assists - Primary assists by the player. Second Assists - Secondary assists by the player. Total Points - Goals scored and assists by the player, outside of the shootout. Shots - Any shot attempt on net (goals and shots on net) by the player, outside of the shootout. iCF - Any shot attempt (goals, shots on net, misses and blocks) by the player, outside of the shootout. iFF - Any unblocked shot attempt (goals, shots on net and misses) by the player, outside of the shootout. iSCF - Any scoring chance by the player, outside of the shootout. iHDCF - Any high danger scoring chance by the player, outside of the shootout. Rush Attempts - Any rush shot attempt (goals, shots on net, misses and blocks) by the player, outside of the shootout. Rebounds Created - Any shot attempt (shots on net, misses and blocks) that results in a rebound shot attempt. PIM - Penalty minutes assessed to the player. Minor - Number of minor penalties taken by the player. Major - Number of major penalties taken by the player. Misconduct - Number of 10 minute or game misconducts taken by the player. Penalties Drawn - Number of penalties committed against the player. Giveaways - Number of unforced turnovers made by the player. Takeaways - Number of times the player takes the puck away from the opposition. Hits - Number of hits made by the player. Hits Taken - Number of hits taken by the player. Shots Blocked - Number of opposition shot attempts blocked by the player. Shots Against - Shots on Goal (Shots and Goals) faced by the goalie. Saves - Saves made by the goalie. Goals Against - Goals allowed by the goalie. HD Shots Against - Shots on Goal (Shots and Goals) that are High Danger Chances faced by the goalie. HD Saves - Saves on HD Shots Against made by the goalie. HD Goals Against - Goals from HD Shots Against allowed by the goalie. MD Shots Against - Shots on Goal (Shots and Goals) that are Medium Danger Chances faced by the goalie. MD Saves - Saves on MD Shots Against made by the goalie. MD Goals Against - Goals from MD Shots Against allowed by the goalie. LD Shots Against - Shots on Goal (Shots and Goals) that are Low Danger Chances faced by the goalie. LD Saves - Saves on LD Shots Against made by the goalie. LD Goals Against - Goals from LD Shots Against allowed by the goalie.